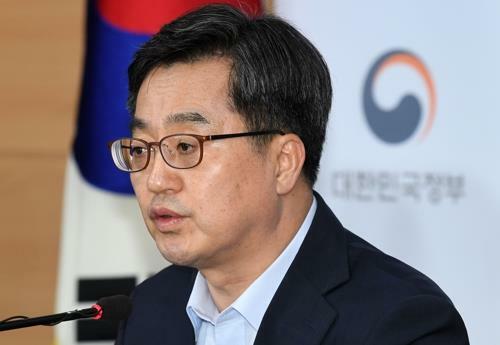 GUNSAN, South Korea, Sept. 19 (Yonhap) -- South Korea's chief economic policymaker said Wednesday that the government will accelerate inter-Korean economic cooperation if conditions become favorable. Earlier in the day, the leaders of South and North Korea agreed to work together for balanced economic development on the Korean Peninsula. South Korean President Moon Jae-in and North Korean leader Kim Jong-un agreed to break ground on a joint project to connect railways and roads across their border this year and vowed diverse cooperative projects to deepen their friendly ties and foster a reconciliatory mood. The agreements were reached during summit talks held in Pyongyang between Moon and Kim. "We will prepare for (inter-Korean economic cooperation) in a calm and orderly manner," Finance Minister Kim Dong-yeon said in a meeting with reporters here. "But inter-Korean economic projects can gather speed if circumstances improve," he said. The minister said any inter-Korean economic projects should need support from the international community, and there are still many things to be done in advance. The latest agreement came months after the leaders reached a deal during their April summit to modernize and eventually connect rail and road systems across their divided border. Field surveys have been carried out to examine the state of some sections of the North's rail and road networks, but the process has not moved fast enough, apparently due to stringent sanctions imposed on the North for its nuclear program. Kim said earlier that the government is looking into various scenarios -- ranging from what can be done by the public sector to what can be done by the private sector, as well as moves that can be made by international organizations -- regarding full-fledged economic cooperation between the two Koreas.